Preheat oven to 200 degrees celsius and put a large pot of water on the stove to boil. Season lamb rack with salt, pepper and olive oil. Place a pan on the stove and once it reaches a high heat, seal entire lamb rack skin side down first. Finely chop mint and cover over the lamb. Place lamb on roasting tray and place in the oven for 20 minutes or until cooked ‘medium’. Peel and dice pumpkin and carrot and place in the pot of boiling water, cook until soft. Strain and set aside. Prep and blanch green beans for two minutes, remove and place in ice bath. Start to prepare the salad by combing all of the ingredients in a bowl, including the green beans. In a small bowl, whisk together the dressing ingredients and drizzle over the salad. Once the carrot and pumpkin have been drained, place them in a food processor with butter, salt and pepper and blitz until a smooth puree. Remove lamb from oven and rest for 5 minutes. 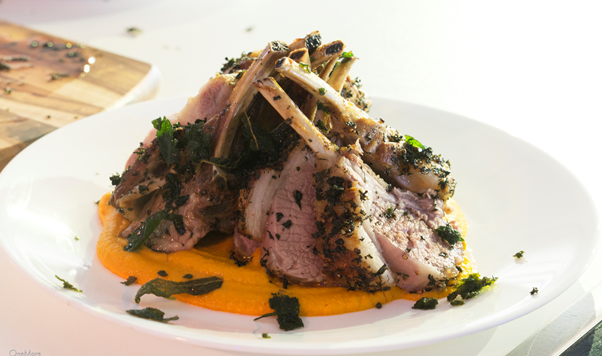 To serve, spoon the puree over two plates, divide rack of lamb into four pieces and stack over puree. Serve salad on the side. Garnish with remaining herbs, salt and pepper. A rich, full bodied Central Otago Pinot with earthiness and depth to wallow in. The pristine cool-climate along with long sun drenched days allowed the fruit to ripen magnificently and produce aromas of deep red cherry, blackberry and cocoa. In the mouth the Squealing Pig is rich and generous with velvet like tannins and a wonderful, long finish.